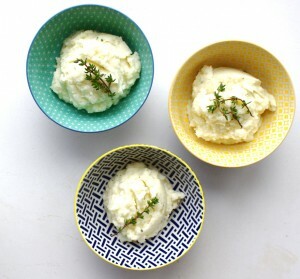 Cauliflower mash with thyme - A healthy and hearty side dish! I love cauliflower mash. Cauliflower was a vegetable I didn’t eat much before I cut gluten and grains from my diet. When I began to miss mashed potato, I turned to cauliflower to fill the void. I must say that compared to potatoes, cauliflower packs a punch when it comes to nutrients. Just one cup of cooked cauliflower provides over 70% of our daily vitamin c requirement. When I first started SCD, I really believed I was destined for a life of bland food. Cauliflower and other vegetables did not appeal to me. As my health and energy improved, I became more passionate about food. I became obsessed with making healthy meals for my family taste amazing. Cauliflower mash with thyme is a staple in our house these days. If I compare the amount of vegetables I eat now to the amount I used to eat before I began SCD, it scares me. It scares me to think of the viscous cycle I was in. My Crohn’s symptoms were terrible so I ate bland food, which I now know I couldn’t digest. That was maker me sicker so that I rarely ate vegetables. As gluten and grains were my staple foods, my body had no chance of recovery without all the vital nutrients I needed. 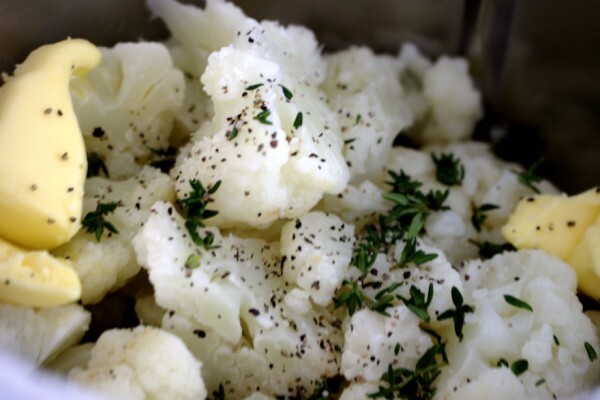 This cauliflower mash with thyme is a great quick side dish to throw together for a mid-week meal. You can even use frozen cauliflower if you don’t have fresh to hand. I’d definitely recommend using fresh rather than dried thyme in this recipe. It really does take this to the next level. Now comes the million dollar question: would I prefer mashed potato to this? Not a chance! Cauliflower mash wins hands down on flavour and nutritional value, any day.